Sierra Leone midfielder Michael Lahoud says that his team-mates have been treated badly and feel humiliated because of the stigma of Ebola. Due to the Ebola outbreak, Sierra Leone have been playing home Africa Cup of Nations qualifiers in neutral venues. "It is really causing a lot of tension and friction," Lahoud told BBC Sport. "People refuse to allow you into places because the first thing they think is that you have have Ebola. It's pretty shocking discriminatory behaviour." The 28-year-old added that some opponents have refused to shake hands with them and opposition fans have chanted "Ebola" at matches. 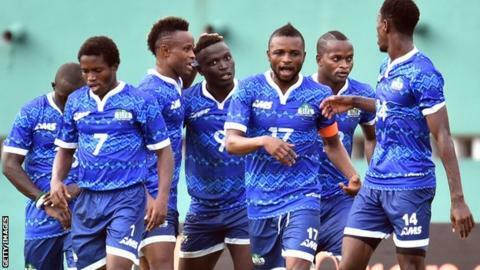 The majority of the Sierra Leone squad play their club football in Europe, Asia or the United States and have not been back to their homeland since July. "One pretty high-profile player on another team, I heard he refused to swap his jersey and instead gave his shorts and they didn't want any of our jerseys in return," continued Lahoud. "I can understand the fear behind it because of the lack of education about the disease but it doesn't make it right. "The fact that we were able to get a 0-0 draw against Cameroon on Saturday is truly testament to the fortitude of our team and the unity that we're having to show through this." Philadelphia Union's Lahoud is a regular in the Sierra Leone squad but is not with the team at present because he is involved in the climax to the MLS season. His last appearance for the national team came against Democratic Republic of Congo in September. "The reaction from fans has been brutal at times. In DR Congo 20,000 people were chanting 'Ebola, Ebola' for 90 minutes," he said. "It's really difficult, it hurts. Most of us are not living in Sierra Leone at the moment but we have family there so this outbreak is a very personal issue. It is probably one of the most painful experiences that I've gone through as a footballer. "You feel humiliated. Being stranded in places like Zambia just trying to get home because they won't let you through because they automatically think you have Ebola." "Walking through the streets in Congo and little kids that you try to give food to, running away in absolute terror of you. Mothers grabbing their kids and running away from you because they think just by you looking at them they're going to get Ebola. It is very humiliating."